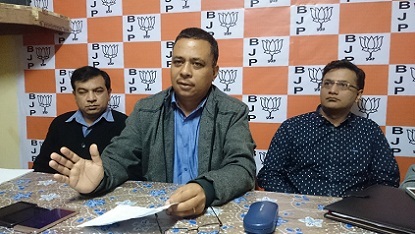 File picture of Meghalaya BJP president Shibun Lyngdoh. Meghalaya BJP will soon get a shot in its arm in the state that goes to poll next year. In a new political development in poll bound Meghalaya, four former legislators will join the BJP in Garo Hills on Friday. According to BJP state unit president, Shibun Lyngdoh, a function is being organized to welcome the four ex-MLAs into the party at Mendal village near Bajengdoba in North Garo Hills district at 12 noon. The four former legislators include two former NPP leaders, John Manner Marak and Omillo K. Sangma. John was the MLA of Bajengdoba constituency while Omillo had represented Kharkutta constituency as MLAs of the NCP when former Lok Sabha Speaker, late Purno Agitok Sangma was leading the NCP. Both John and Omillo were also with Purno when he formed the National People’s Party (NPP) in Meghalaya. The other two former MLAs who would join the BJP along with John and Omillo include Billykid A Sangma and former NCP MLA from Rangsakona, Adolf Lu Hitler Marak. Billykid A Sangma is likely to contest from South Tura constituency and former NCP MLA Adolf Lu Hitler Marak was with the Congress few years ago.